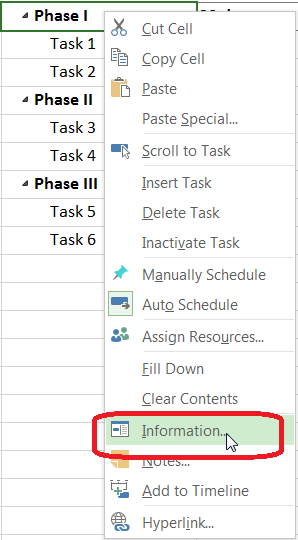 I'm managing a project in MS Project Pro 2013 with several phases, which I have distinguished by summary tasks. Under these summary tasks I have plenty of other tasks, several again summarized. 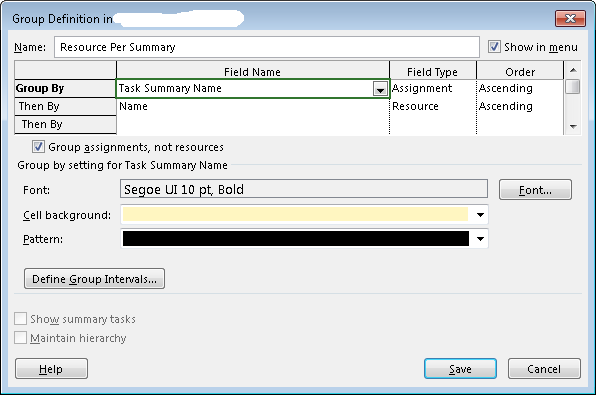 Note that I do NOT have resources assigned to the summary tasks, only to the individual tasks. I would like to generate a report in which I can see a list of resources, their hours and cost, grouped by each phase of the project. How do I setup such grouping? As a reference, the following group setting groups in the Resource Usage by closest summary task (therefore not the highest level summary task). And, in a Report, using this group definition this does not display anything. I also used summary tasks to model my different project-phases (how dare I?!). Which lead me to your problem. MS Project tries REALLY really hard to hide useful and simple features. Now the only thing left is to roll up resource names. You can use a macro from this answer. Not the answer you're looking for? Browse other questions tagged ms-project ms-project-2013 resources or ask your own question.